September 2016 - Communication from AHT regarding where we are now. This will allow them to decide on which healthy control dog and which with a disorder they choose to sequence. Once they have determined which dogs to sequence they will advise us regarding the DNA samples required. The process will take a number of months for all 75 breeds, so they are proceeding in smaller batches to keep up the momentum. 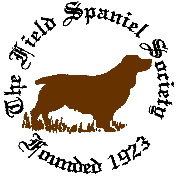 The Field Spaniel Committee are very pleased to announce that we have been accepted onto the "Give A Dog A Genome" project. The project is a collaboration between the Kennel Club Charitable Trust and the Animal Health Trust ( AHT ) and initially 50 dog breeds have been invited to take part. One dog will be selected from each breed by the AHT and DNA from these dogs will be used to sequence the entire genome of these breeds, during 2016. I spoke to Dr Cathryn Mellersh today at the AHT and she tells me that the information gained will provide genetic markers that can be used to aid our understanding of the variation within the canine genome. In the future scientists will be able to identify disease mutations and this in turn will aid both prevention and hopefully cures for disease. This is a very exciting time and I will bring you further information and updates as our participation in the project progresses. Further Links for Information regarding this can be found at the AHT site . Every genome we sequence is a permanent resource which will contribute towards our research for many years to come, to the benefit of all breeds – not just those we can sequence now. By undertaking this colossal task - DNA is a string of A, C, G & Ts…if each was 1mm long the whole genome of each dog we sequence would stretch from Lands End to John O’Groats and back again! - we will enhance our understanding of which changes in DNA sequence have an effect on dog health and which changes are benign or neutral. March 2017 - Communication regarding where we are now. We are now progressing well with the Genome Project. We have our 3 dogs as required by the Animal Health Trust, the owners have been in contact with the Trust and they are in the process of completing what the Trust have asked of them. May 2017 - Communication regarding where we are now. As you already know, we selected a healthy, older Field Spaniel to be whole genome sequenced as part of Give a Dog a Genome (GDG). A DNA sample from a suitable dog has now been sent to a commercial laboratory for sequencing. The sequencing is expected to take up to 8 weeks to complete, after which the data will be made available to us to download, process and analyse. The volume of data generated for each individual sample is extremely large and takes 3-4 days to download and process. The data will then be used as control data in in current and future investigations of genetic disease in various dog breeds. While you will continue to receive any general GDG updates, you will probably not receive any further GDG communications specific to the Field Spaniel. I would once again like to thank you and the breed community for participating in Give a Dog a Genome (GDG).